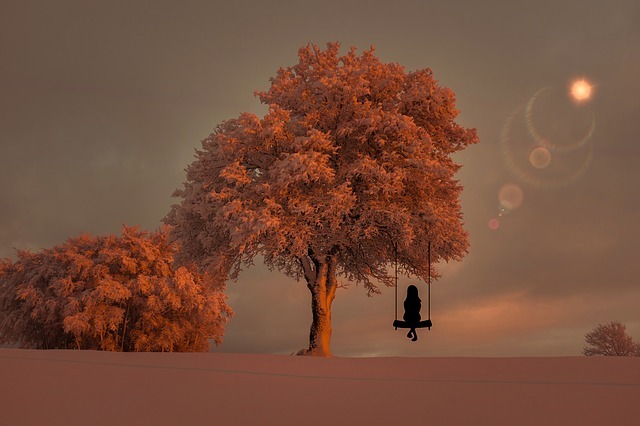 The sense of not belonging - Author Cristina G.
Do you ever feel like not belonging anywhere? I do. Often. Way too often. Sometimes I even feel like I don't belong to my body. I don't feel trapped in it, no. I am a woman, and I don't wish to be a man. I am glad about the way I look. I am grateful for it. But I do care for it a lot. I used to, at least. Anyway, it's not the not belonging to the body that worries me. That's secondary to everything, the last thing really. It's the not belonging to the world that terrifies me. Why is it that I feel this way? Is it because I am over 40, single and without children? Or is it because I am alone in a country that isn't mine? I am an immigrant, yes. I left my country when I was 24. I was born and raised a farmer during a communist regime. When I got to Italy, everything seemed huge to me, especially the pizza. You should have seen me looking at that massive pizza and thinking that no human being would ever be able to finish eating something so big. "Is this pizza for all four of us?" I asked. "No. That's yours. We ordered a vegan meal." I didn't blink. I was too scared to even look at someone. I was a little country girl in a big, big world with a massive pizza in front of her. I couldn't eat. I tried, but it didn't work out, my teeth refused to chew. They lectured me because I was wasting food when so many starve. Italy was amazing. The food was delicious but not from the start, no. The first pasta al pomodoro meal made me think that I was going to starve to death. I couldn't stand the look of it. A few months later, I was addictive to it, it’s the best meal in the whole world. So you see, it's all a matter of practice. You should give up only when you reached your goal. Never before. Ten years I spent in Italy – one of the most beautiful countries on the planet – maybe the most beautiful. The sense of not belonging never left me during these years. I wrote a memoir about this period: "Ten Years in Italy, Three Weeks a Human." The title is very revealing, the truth is that I was, and I am so, so grateful for the opportunity to have learned to speak the most melodious language of them all. I went back to my ex-communist country to heal my wounds. Wow. It did not feel like home at all. I couldn't fit back in. I never fitted in. Perhaps I was born in the wrong era. In 2014, I moved to the UK, but my expectations were not great. Learning the language, improving my pronunciation was my only aim. A year later, I figured it was time to follow my childhood... my impossible dream really. I wanted to be a writer since I was 8. I wrote many stories... but I didn't know I could publish them. To be honest, I never thought I had the right to write or to dream for that matter, so I burned them down. All of them. I could not imagine seeing my name on the cover of a book. It was outrageous! I was born a farmer in a communist country, children didn't know how or what to dream back then. My destiny was sealed, but I didn't feel like I belonged to the farmers' world. I was an imposter. In all honesty, I love working the land, and I am grateful for the opportunity to have learned how to do it properly. I am an author now. In three years (2015 - 2018) I wrote and published more than 38 books, in both English and my mother tongue. I couldn't be happier, however, do I really belong to this world? Maybe it's not my place to publish books. I don't know if I'll ever feel like belonging somewhere, anywhere, but I am grateful that my impossible dream came true and I can tell the world what I feel. I know I am not alone, and that makes me sad. Why do we cry when others cry?